BIG SALE!! CRYSTAL BALL SETS BIG SALE!! Save More Money, Buy a Set! 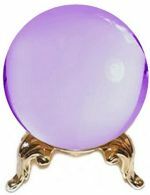 Beautiful optically pure Crystal Ball, with matching square crystal stand available in 7 sizes 50mm to 200mm in diameter as seen in dozens of movies and TV shows! Have you seen them on the Strain and The Honorable Woman? Perfect for scrying or as unusual visual piece which can't help but mystify. This set comes in its own magnetic lid red or blue fabric backed gift box. 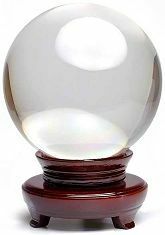 Authentic optically pure Crystal Ball with a solid rosewood rotating stand is available in 6 sizes 80mm to 200mm in diameter. 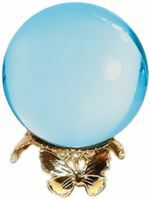 Perfect for scrying or as a classic desk ornament, Crystal Balls are a Hollywood favorite, seen regularly in power play movies and TV shows! Check them out on Gotham and Scandal. The rosewood stand swivels and has a red felt lining. This set comes in its own magnetic lid red or blue fabric backed gift box. 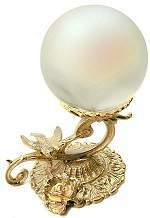 Beautifully detailed Princess Gold Plated Stand is shown with a 2" or 50mm Purple Crystal Ball, or choose any of the 11 colors listed in the drop down menu below to make up this Ball Set. 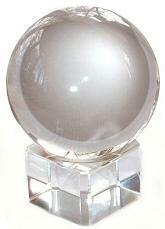 Every where you look on TV or in the movies there is a crystal ball on someone's desk! Join in the conversation and add one to your desk. This set comes in its own magnetic lid red or blue fabric backed gift box. Beautifully detailed Butterfly Gold Plated Stand is shown with a 2" or 50mm Aqua Crystal Ball, or choose any of the 11 colors listed in the drop down menu below to make up this Ball Set. This is a fabulous conversation piece that captures the imagination as well as a stunning decorative accessory which enhances any decor. This set comes in its own magnetic lid red or blue fabric backed gift box. This is a gift you will be lovingly remembered for. The AB Fluted stand and crystal ball set is truly a breathtaking combination, this decorative piece will distract and impress guests and family. 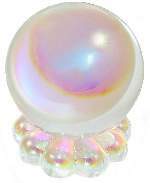 It is shown with a 2" or 50mm Aurora Borealis Crystal Ball, or choose any of the 12 colors listed in the drop down menu below to make up this Ball Set. 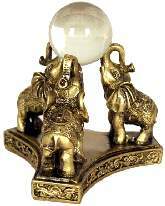 Antique gold ceremonial elephants sphere stand with a clear 50mm or 2" crystal ball. The elephants stand on an embossed decorated base and support a separate (unattached) perfectly clear optically pure round crystal ball. This is a great Feng Shui accessory. 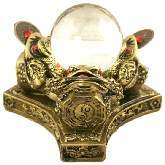 Antique gold ChanChu Money Frogs sphere stand with a clear 50mm or 2" crystal ball. The three ChanChu Frogs have a separate Chinese Lucky coin in their mouths and stand on an embossed decorated base which support an unattached perfectly clear optically pure round crystal ball. This is a great Feng Shui wealth cure!! The opalescent reflection of the Moonlight Crystal Ball lets you spin your dreams by moonlight. A Dove sits on a curved bough eyeing a rose below on the Victorian style stand. Together they make an exquisite gift that you'll be long remembered for.